It only seems fair that Delaware is the first state in these installments. After all, the state's motto is "The First State". As I was standing out front of the establishment a group of 4 or 5 young ladies came walking up. The were wearing nice dresses and they were all done up as if they just came from some kind of an event, such as a wedding. Usually this doesn't throw up any flags with me. Usually white collar women tend to dress a little better then the white collar men. By the time I see any white collar men their ties are pulled down or they're around their head in Rambo style. The reason that the flags went off was because these girls just looked too young to be that formal. "How's it going tonight ladies?" One girl answered as the others started searching for their i.d. 's, "Good, how are you tonight?" "I'm doing well. I need to see your i.d. 's please. Was there a wedding tonight?" "No, we're just out and about." I looked over the i.d. 's and as I gave them back they all started to file into the establishment. Then I came to the last one. I stood there for a minute looking at the i.d. There was just something about it that didn't sit well. It looked legit but I kept looking at the face of the girl that handed it to me and she kept looking around. Then I tilted the i.d. to see the holograms and I knew what was wrong. It was a complete fake. According to the laws here, when we take away a fake i.d. they want us to take away the real i.d. as well. This way they have the person's real name and information when it comes to prosecution. I rarely ever do this. I figure that just taking away the i.d. is enough of a punishment. 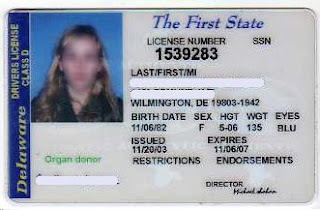 Some fake i.d. 's could cost close to $200. I looked back at the girl and asked for a second form of i.d. Then I noticed that she was looking at the front door. I looked over my shoulder and saw one of the previous girls standing there. "Miss, unless you have a real i.d., I can't let you in here. This i.d. is fake." "Oh, ok... well... I'll just leave then," and she reached for the i.d. I pulled my hand back and slipped the i.d. into my pocket. "You can leave but you can't have this back." After seeing me put the i.d. into my pocket, the girl's friends all came walking back out. The typical arguments of "It's illegal to take that away", "Your stealing her property", and "We'll call the cops" ensued. I told them that I'd gladly call the cops if they wanted me to. After a few minutes a squad car was driving by so I asked the girls if I should ask the cops to stop over. They said no and slowly walked away. This is the i.d. that was presented to me. All in all it's a fairly decent fake. There are many different things wrong with it other than the hologram that I'm not going to get into at this time. If you look closely at the i.d. you can partially see the hologram that was used. You can barely make out some lettering. 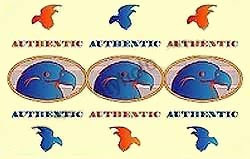 That lettering is used to spell the word AUTHENTIC which is on the list of wording that will never be used on an i.d. that is issued by the US or State governments. Along with the lettering are three Bald Eagle images in the middle. This particular image will also never be used on real i.d.'s. As for the three images above and below the lettering and bald eagle images, I'm still wondering what they're supposed to be. I'm guessing that it's either a swooping bird of some type or just a blob of some kind. For easier viewing, I've also posted what the hologram looks like before it's applied to the card stock. If you are working the door and you have an internet ready phone there's one other thing you could do. I did this as I was writing this entry. Go to google.com/maps and enter in the address that is listed on the i.d.. I'd say that more than half of the time the addresses on the i.d. 's are fake. As it was with this one. The city, state and zip code were real but the actual street name did not exist on Google. Maybe it's not in their database but that and the hologram together would be enough for me to take away the i.d. Actually, the hologram was enough all by itself. I'm glad I stumbled onto this blog. It's interesting and informative. I'll drop by frequently and recommend it to other security professionals.